This is a sheet of retinal pigment epithelial tissue placed under the retina of a cadaver eye. 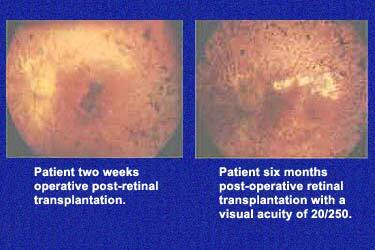 Intact sheets of immature retina implanted in the subretinal space of retinitis pigmentosa patients and patients with dry age-related macular degeneration is a therapy that is experimental is being conducted by Dr. Radtke at Norton Audubon Hospital in Louisville, Kentucky. At this time the animal work shows excellent results for the transplantation of the two layers of the retina that are degenerated in patients with retinitis pigmentosa and dry age-related macular degenerated. 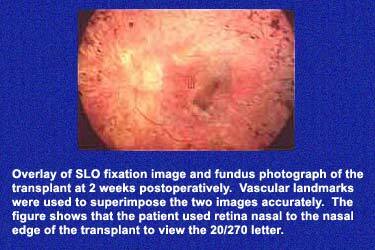 Retinal transplantation has shown a modicum of success in two patients with retinitis pigmentosa, but these patients were only transplanted with one layer. 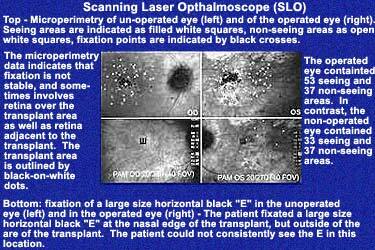 The new experimentation that is presently being conducted is now transplanting two layers, both the retinal pigment epithelium and neuroretina, in patients with retinitis pigmentosa and age related macular degeneration. Because the animal studies have been so positive, this is going to be continued and these studies are now in Phase I and are progressing to Phase II with FDA supervision and the Human Studies Committee’s approval. The team’s latest research advanced to implant the most potential layers (which include the retinal pigment epithelium and neuroretina) gives hope, especially for patients with macular degeneration and retinitis pigmentosa. 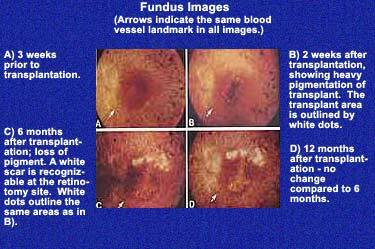 Other diseases that might be helped are Stargardt’s disease and dystrophy of the retinal pigment epithelium. There is currently no treatment available that can reverse the degenerative process. 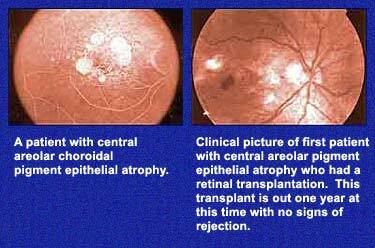 However, there is hope for patients who still have intact retinal ganglion cells, and the research team can now replace degenerated photoreceptors and retinal pigment epithelial cells which gives hope for restoration function. By transplanting an intact sheet of neuroretina and retinal pigment epithelium, we can now repair an area of damaged retina resembling a normal retina. 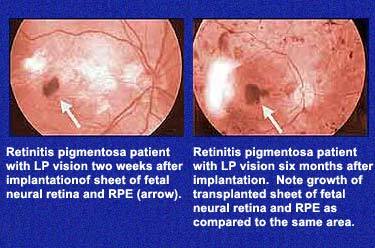 This retina functions like a normal piece of retinal. It has connections to the brain in animals like a normal piece of retina would, and there has been some function seen by stimulating the blind retina in rats and recoding electric function in the brain. This holds tremendous potential for the future, and we are using benchmark research with parallel clinical trials to improve the results as new factors are uncovered from our basic research. 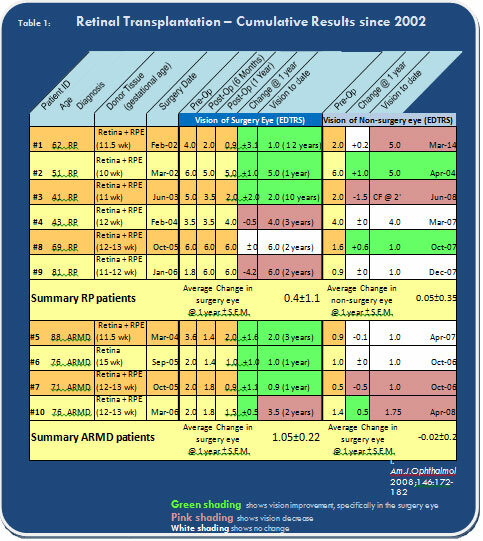 These are the first steps and we hope very successful ones for patients who have retinitis pigmentosa and dry macular degeneration.